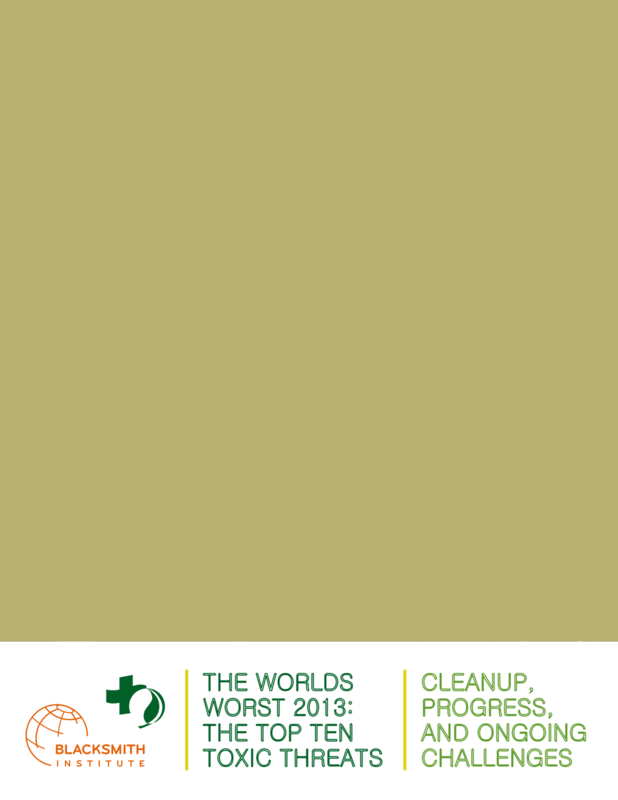 THE WORLDS CLEANUP, WORST 2013: PROGRESS, THE TOP TEN AND ONGOING TOXIC THREATS CHALLENGES This document was prepared by Blacksmith Institute and Green Cross Switzerland with input and review from a number of experts and volunteers, to whom we are most grateful. For questions, comments, and feedback, please contact: Angela Bernhardt Blacksmith Institute 475 Riverside Drive, 860 New York, NY 10115 +1 212 647 8330 angela@blacksmithinstitute.org Nathalie Gysi Green Cross Switzerland Fabrikstrasse 17 8005 Zurich, Switzerland +41 (0) 43 499 13 10 nathalie.gysi@greencross.ch TABLE OF CONTENTS Introduction and Context 4 Flagging Polluted Places 4 From Ten to Many 4 Scope of the Problem 5 Toxic Pollution and Human Health 6 A ddressing the Identifed T o xic Threats 7 What Can Be Done? 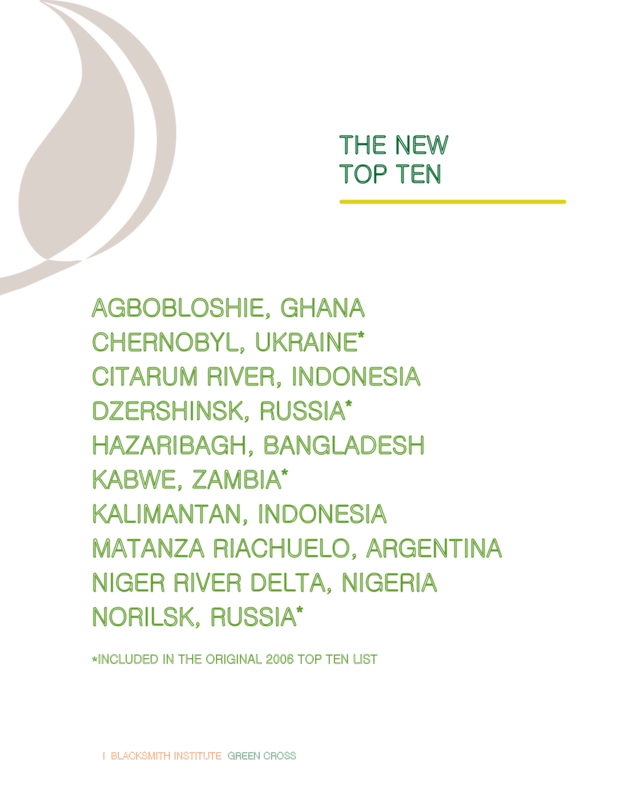 7 The New Top Ten 8 Background and Rationale 9 Agbogbloshie Dumpsite, Ghana 10 Chernobyl, Ukraine 12 Citarum River, Indonesia 14 Dzershinsk, Russia 15 Hazaribagh, Bangladesh 16 Kabwe, Zambia 16 Kalimantan, Indonesia 17 Matanza-Riachuelo, Argentina 17 Niger River Delta, Nigeria 18 Norilsk, Russia 18 A Special Note on Fukushima 15 The 2006 and 2007 Top Ten: Where Are They Now? 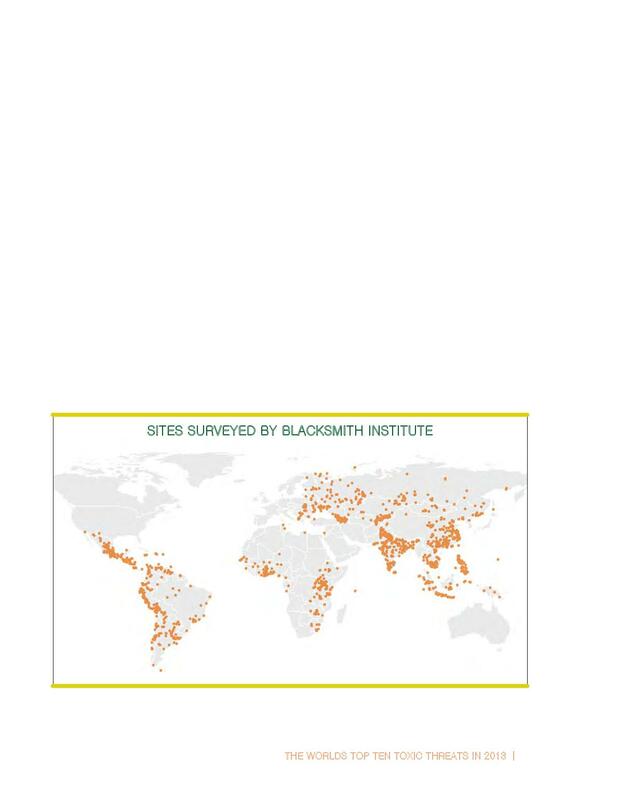 This document was prepared by Blacksmith Institute and Green Cross Switzerland with input and review from a number of experts and volunteers, to whom we are most grateful. 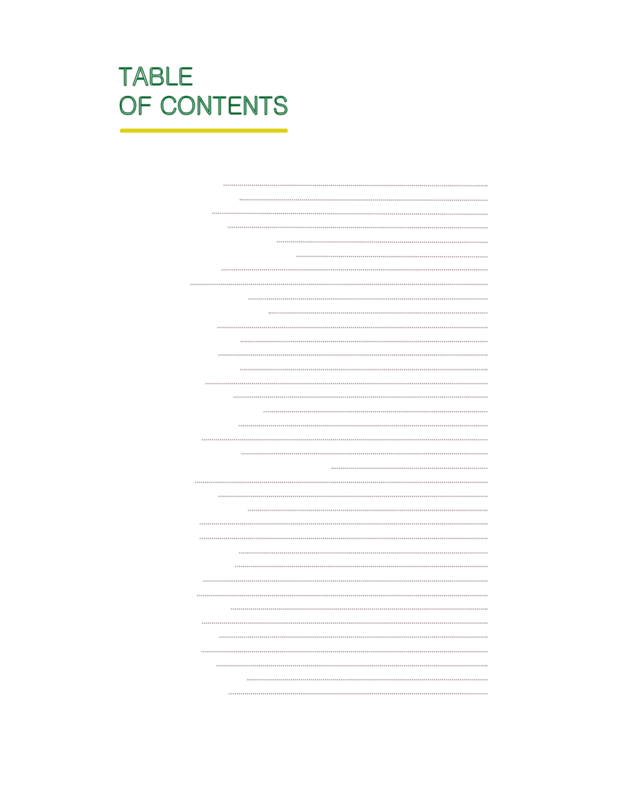 This 2013 report is the eighth in an annual series of reports released by Green Cross Switzerland and Blacksmith Institute. Previous reports have high-lighted some of the world’s worst polluted places, presented examples of successful cleanup projects, and outlined the world’s worst pollution problems. This year’s report takes a look at the progress made in dealing with some of the world’s worst polluted places and sets this against the ongoing identiﬁcation of thousands more, less notorious, polluted places. This examination of industries, pollutants, and sites is based on data collected by Green Cross Switzerland and Blacksmith Institute and on industry information, public sources, and the scientiﬁc literature. Flagging Polluted Places The World’s Worst Polluted Places reports in 2006 and 2007 brought problems of highly polluted places to international attention by listing about 40 notori-ous sites worldwide, selected by a panel of knowl-edgeable specialists. These listings, as explicitly acknowledged in the reports, were based on limited information and data. This was only to be expected, since pollution by its nature shuns the spotlight. of the toxicants involved; and clearly established pathways and impacts. These have not changed. However, the lists of sites that are now the focus of “polluted places” efforts have certainly evolved. This Top Ten Toxic Threats report builds upon previous reports to highlight the progress of many contaminated sites and an increased understanding of the far-reach-ing effects of toxic pollution. The 2012 report utilized disability-adjusted life years (DALYs) to reveal that over 125 million people are at risk from toxic pollution in 49 low- and middle-income countries. That number has since been revised up to 200 million. The strikingly high number of people at risk established toxic pollu-tion as a public health threat equivalent to more highly publicized public health problems such as malaria and tuberculosis. Even though toxic pollution remains a far less well-known problem, it is believed to have a similar impact on death and disability in developing countries as many well-known and well-funded diseases. This year’s report demonstrates this increased understand-ing of the problem and how much progress has been made in the past several years. It also demonstrates how much further there is to go. bates that the Top Ten lists generated. Real progress has been made in some cases, although not every-where and often not enough. The ﬁndings show that much can be achieved through focused intervention and site remediation, but also that much more re-mains to be accomplished at some of these sites. From a broad scope of problems identiﬁed in the initial reports, the work of Green Cross Switzerland and Blacksmith became more focused on mining, industrial and chemicals issues as critical areas for addressing contamination and remediation. Green Cross and Blacksmith also recognized that other important problems such as urban air pollution, dirty rivers, and industrial accidents are wider than just “polluted places” and require different approaches. The emphasis in interventions has been increasingly on a relatively small number of sectors that result in widely distributed but similar problems, rather than individual high proﬁle hotspots. This shift has been guided by the large amount of data that has been gathered over recent years on nearly three thousand individual sites in more than 70 countries. then examined the burden that toxic pollutants can put on population health in the context of the contaminated sites that are the focus of Green Cross Switzerland and Blacksmith’s work. The identiﬁcation and investigation of polluted sites is an ongoing task, increasingly being picked up and shared by local agencies in the countries involved. Therefore discussion of geographic regions in this report is by no means complete since it only represents sites are have been identiﬁed and are under investigation to date. The shortage of adequate resources in many low-and middle-income countries increases the severity of health impacts from toxic pollution while simulta-neously marginalizing those who need help the most. 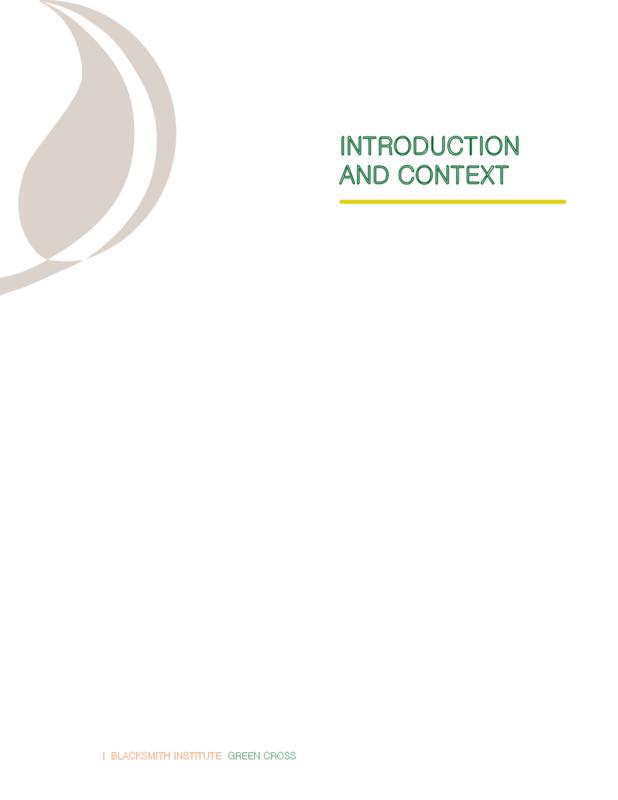 An objective of the work of Blacksmith Institute and Green Cross Switzerland and one goal of this report is to enhance understanding and funding for this crucial area of public health. 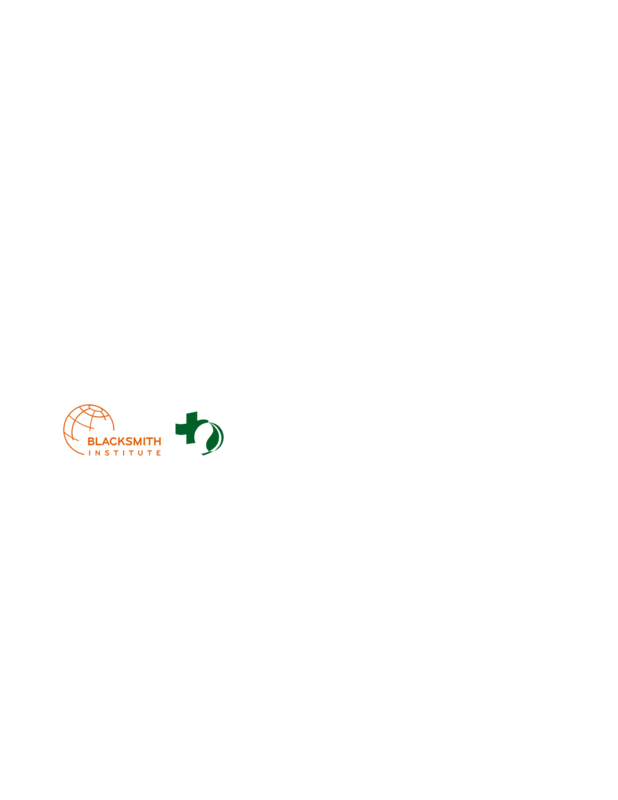 Addressing the Identiﬁed Toxic Threats The objectives of Green Cross Switzerland and Blacksmith are not just to identify and publicize toxic problems but, more importantly, to ﬁnd and implement practical solutions. This requires, in the most urgent cases, beginning to put in place effective approaches even if the initial solutions are only a start on the long-term cleanup that is required. One of the most important areas of progress since the initialWorld’s Worstreports is the gradual emergence of a broad coalition of international organizations, public and private, who have recognized the scale and importance of the toxics agenda and who are cooper-ating to address it. put in place better systems and cleaner processes. The good news is that the scale of the problem worldwide is slowly becoming better deﬁned as more data is collected and as the underlying science is better understood. The work highlighted in the recent years on quantitative evaluation of health risks from polluted places continues to be expanded and reﬁned. The toxics agenda is becoming even more relevant to achieving international goals in areas such as maternal and child health, since the impacts may be signiﬁcant at levels well below those at which clinical symptoms are seen. Unfortunately, the high health impacts estimated in previous reports may still be an underestimate of the damage caused by polluted places. What Can Be Done? Greater efforts need to be made to control pollu-tion and waste, as it is markedly easier and more economical to prevent toxic pollution problems than to clean them up. This series of annual reports ex-ists not only to identify the major sources of toxic pollutants but also to present and explore some of the simple and cost-effective solutions that exist to remediate them. For each industry listed in this re-port, available preventative actions and remediation solutions are discussed. These solutions are meant to display the varied options that exist to reduce the risk of toxic pollution exposure. By presenting these options, the report hopes to encourage governments and industries to practical action. Norilsk, Russia ! 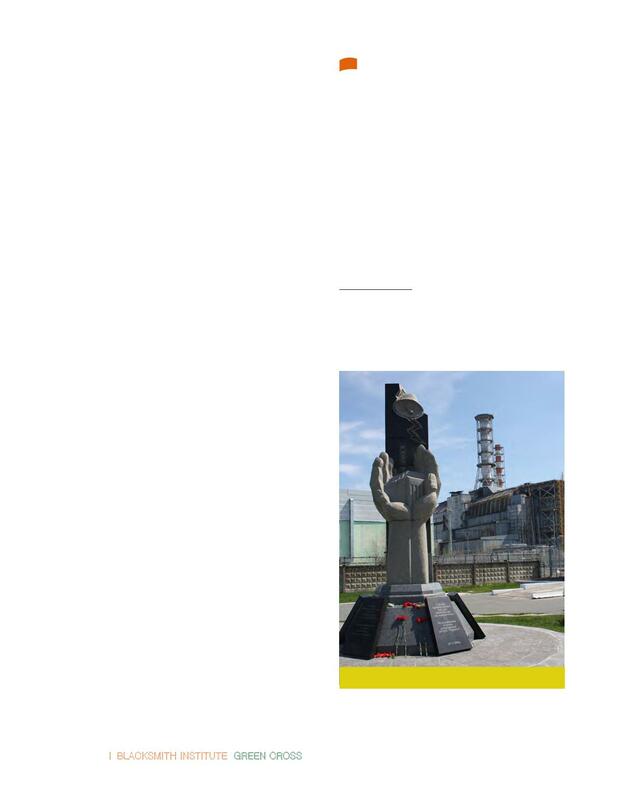 Dzerzhinsk, Russia Chernobyl, Ukraine!! 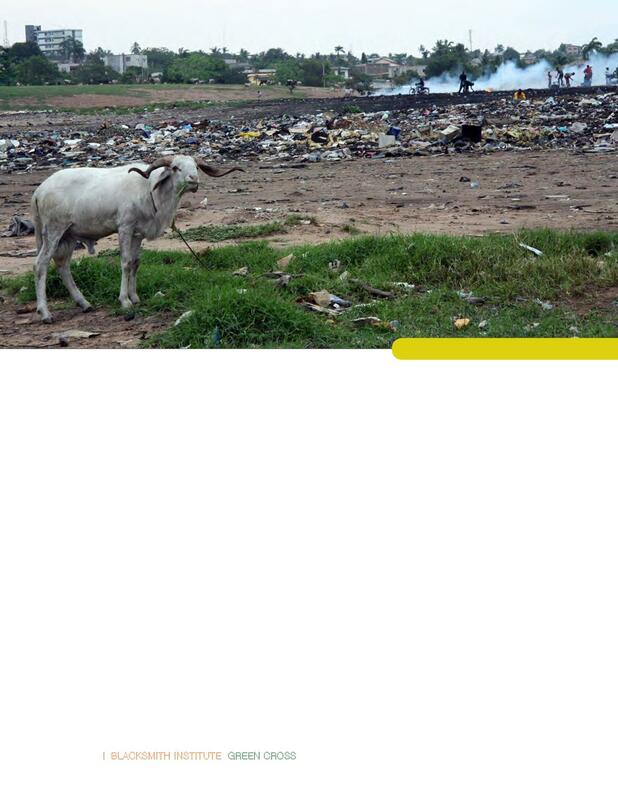 Niger River Delta, Nigeria Agbogbloshie Dumpsite, Ghana!! Kabwe, Zambia ! Matanza Riachuelo River Basin, Argentina ! 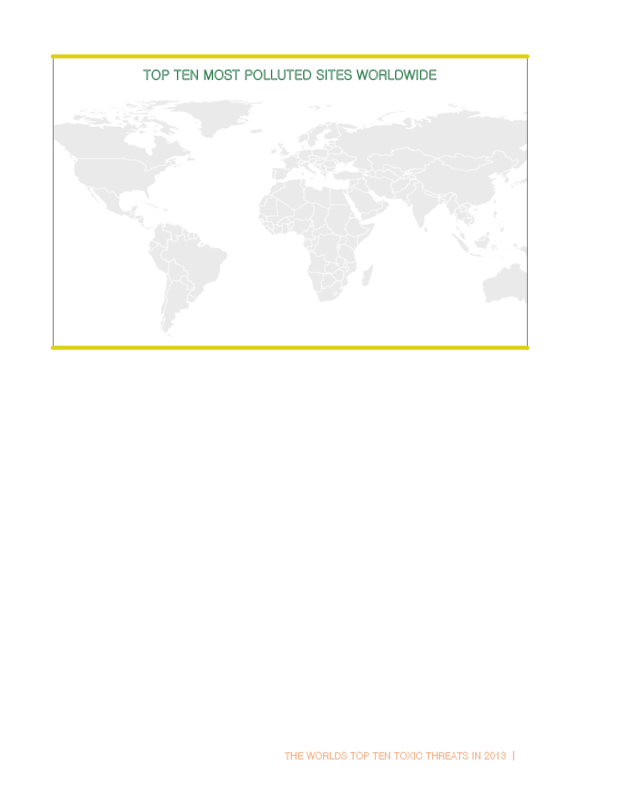 Background and Rationale The 2006 and 2007World’s Worstreports highlighted some particularly notorious polluted sites around the world. These were chosen based on a version of the widely accepted Source-Pathway-Receptor model. Locations were included for review if a toxin from an industrial source was found in a human exposure pathway above international standards. Fundamentally, those sites with toxins most above the standard, in the most severe pathway, and affecting the most people were selected to comprise the Top Ten. This was based on very limited information available at the time, thus the selection was somewhat constrained. Kalimantan, Indonesia Citarum River, Indonesia!! bring attention to the efforts by governments and other organizations to deal with toxic pollution, highlighting speciﬁc projects and success stories. From 2009 to 2011, polluting industries and individual toxins formed the focus, rather than speciﬁc sites. The top pollution sources were identiﬁed and prioritized based on the total number of people they place at risk. In 2012 this approach was further reﬁned through the use of Disability Adjusted Life years (DALYs), the standard metric for measuring the burden of disease. DALYs much more accurately capture the health risk posed by pollutants and industries. The 2013 World’s Worst builds on these reports, using information and risk assessment data from the databases. Sites were chosen based upon the severity of their risk to health, identiﬁed by both site assessments and independent reports. Sites were also prioritized in terms of providing examples of similar sites around the world. Some of the sites selected, such as Dzershinsk, Russia or Kabwe, Zambia, appeared in the original Top Ten lists. Limited progress has been made at these sites in view of the size of the problem. Other names on the list, such as Agbogbloshie, Ghana or Kalimantan, Indonesia, were selected less for the scale of their local health impact, and more as examples of speciﬁc pollution problems (e-waste and artisanal gold mining, respectively) which collectively place an enormous toll on human health. Importantly, some broad criteria guide the selection of sites included in this report. Blacksmith Institute is focused on addressing point-source industrial pollution that poses a public health risk in low and middle-income countries. Accordingly, this report takes the same approach. The well-known issues of ambient urban air pollution or arsenic contaminated wells were not considered for inclusion. Agbogbloshie Dumpsite, Ghana Agbogbloshie, in Accra, Ghana, is the second largest e-waste processing area in West Africa. E-waste, or electronic waste, is a broad term referring to a range of electronics, including refrigerators, microwaves, and televisions. Because of the heterogeneous composition of these materials, recycling them safely is complex and can require a high level of skill. 1 Feldt, Torsten, Julius N. Fobil, Jurgen Wittsiepe, Michael Wil-helm, Holger Till, Alexander Zoufaly, Gerd Burchard, and Thomas Goen. 2013. High levels of PAH-metabolites in urine of e-waste recycling workers from Agbogbloshie, Ghana.Science of the Total Environment466-467, 1 (January): 369-376. 2020. Approximately half of these imports can be immediately utilized, or reconditioned and sold.2The remainder of the material is recycled, and valuable parts are salvaged. A range of recovery activities takes place in Agbogbloshie, each presenting unique occupational and ecological risks. The primary activity of concern from a public health perspective is the burning of sheathed cables to recover the copper material inside. Styrofoam packaging is utilized as a fuel to burn the material in open areas. Cables can contain a range of heavy metals, including lead. To some extent, these metals can migrate through particulate in the smoke, while signiﬁcant amounts are also left behind on area soils. 3 Caravanos, Jack, Edith Clark, Richard Fuller, and Calah Lam-bertson. 2011. 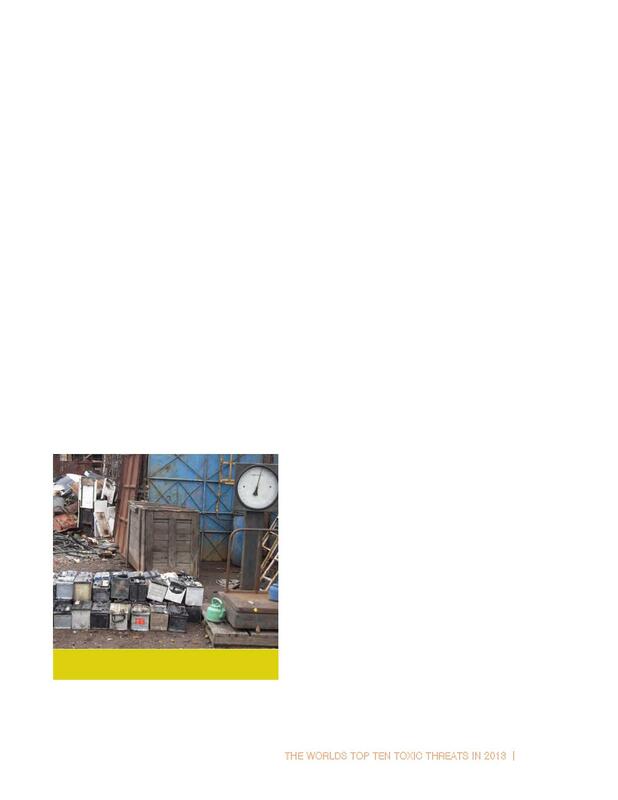 Assessing Worker and Environmental Chemical Exposure Risks at an e-Waste Recycling and Disposal Site in Ac-cra, Ghana.Journal of Health and Pollution1, 1. 4 Caravanos, Jack, Edith Clark, Richard Fuller, and Calah Lam-bertson. 2011. 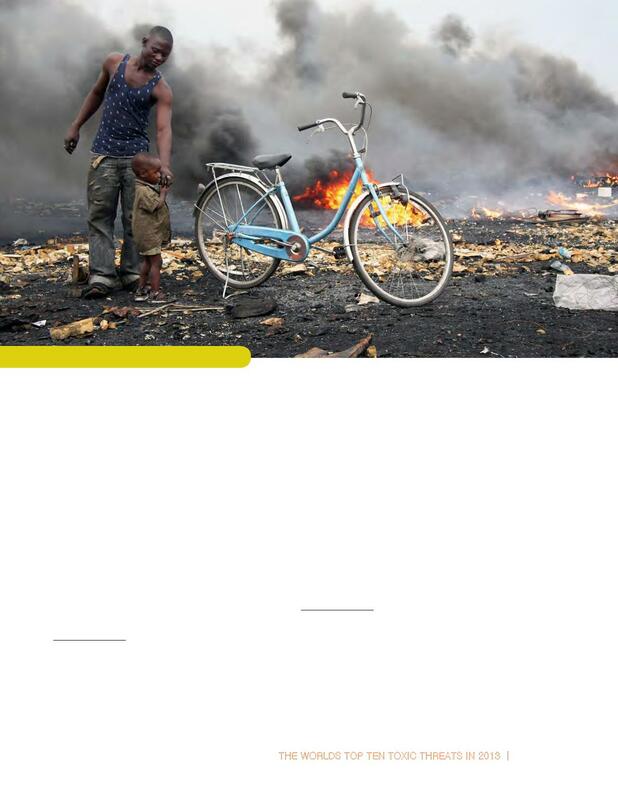 Assessing Worker and Environmental Chemical Exposure Risks at an e-Waste Recycling and Disposal Site in Ac-cra, Ghana.Journal of Health and Pollution1, 1.